The Dominion Radio Astrophysical Observatory was inaugurated in 1960 at White Lake near Penticton, British Columbia. The creation of the observatory was primarily the work of Carlyle Smith Beals, an astronomer who wanted to advance the field of astrophysics in Canada. 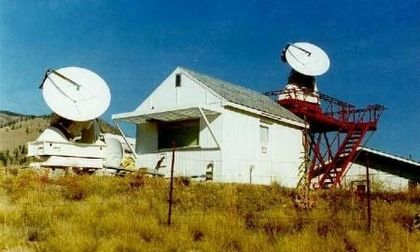 The first parabolic antenna, measuring 25.6 metres, began operating in 1960. It was mainly designed to operate at a wavelength of 21 centimetres, which corresponds to one of the spectral lines of hydrogen. The study of hydrogen is of great importance to astronomers: hydrogen is the most abundant chemical element in the Universe, where it is present as a gas, and studying its distribution in the Milky Way can help astronomers reveal the structure of our galaxy. Radio astronomers at Penticton have been striving towards this goal since the first days of the observatory. In 1962, a second radio telescope was put in place. Fully operational in 1964, it consisted of 1,700 cedar posts that extended for 1.3 kilometres in the shape of a “T” to cover a surface area of 65,000 square metres. The posts supported a network of several thousand metres of metallic wires formed the antenna of the radio telescope. This radio telescope was primarily used between 1965 and 1969 during a period when solar spots were at a minimum. In fact, it is only during these periods of low solar activity that very long radio waves from space can pass through the atmosphere to reach Earth’s surface. The main goal of the T-shaped radio telescope at Penticton was to produce a map of radio sources in our galaxy. It was also used to observe several hundred specific radio sources, such as quasars and distant galaxies. In 1965, a 1.8-metre parabolic antenna was installed to collect data on solar radiation. The radio telescope operated at a wavelength of 11.1 centimetres and its goal was to complement the data already gathered by the Algonquin Radio Observatory at Traverse Lake in Ontario. 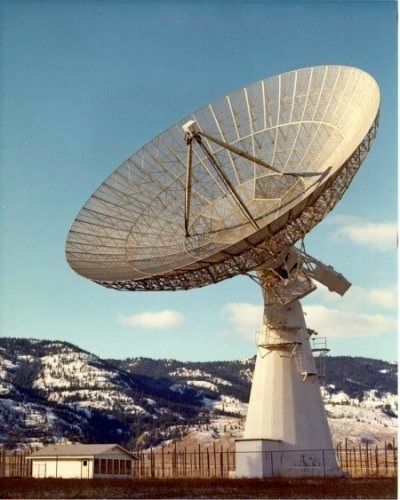 In 1968, the 25.6-metre radio telescope at Penticton was used in conjunction with the 46-metre telescope at the Algonquin Radio Observatory to simulate the resolution of a giant radio telescope measuring 3,074 kilometres (the physical distance between the two instruments). It was the first successful long distance interferometry experiment ever conducted. 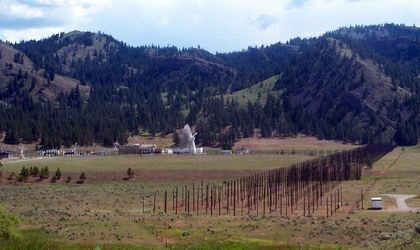 Encouraged by the results, the Dominion Radio Astrophysical Observatory commenced the construction of a synthesis radio telescope near the end of the 1960’s. It consisted of two parabolic radio telescopes measuring 8.5 metres across that would operate together to simulate a larger radio telescope with a 600-metre diameter. The antennas would operate at a wavelength of 21 centimetres, which corresponds to one of the spectral lines of hydrogen. Today, the synthesis array radio telescope consists of seven 8.5-metre parabolic antennas that can operate continuously, 24 hours a day, at two wavelengths (21 and 74 centimetres). From 1995 to 2005, the radio telescope was mainly used in the Canadian Galactic Plane Survey, the goal of which is to map a large portion of the Milky Way. 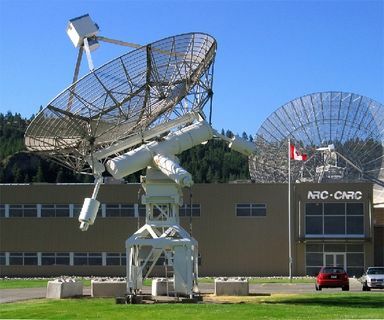 In 1990, following the closure of the Algonquin Radio Observatory, the task of gathering data on the Sun’s radio flux (the variations in its energy output at radio wavelengths) was transferred to the Dominion Radio Astrophysical Observatory at Penticton. The observatory is now under the responsibility of the National Research Council of Canada’s Herzberg Institute of Astrophysics.